Spending Thanksgiving at Disney Parks? We’ve got some special one-day-only offerings this year at both Disneyland Resort and Walt Disney World Resort! Starting here in Orlando, Florida, Magic Kingdom Park at Walt Disney World Resort is serving up turkey and mashed potatoes at Pecos Bill’s Tall Tale Inn and Cafe; mosey on over to Frontierland to partake in this hearty feast that includes turkey, mashed potatoes, stuffing, green beans, cranberry sauce and gravy. Sunshine Seasons in Epcot will also be serving a Thanksgiving plate for lunch and dinner consisting of turkey with gravy, mashed potatoes, stuffing, green beans and cranberry sauce. 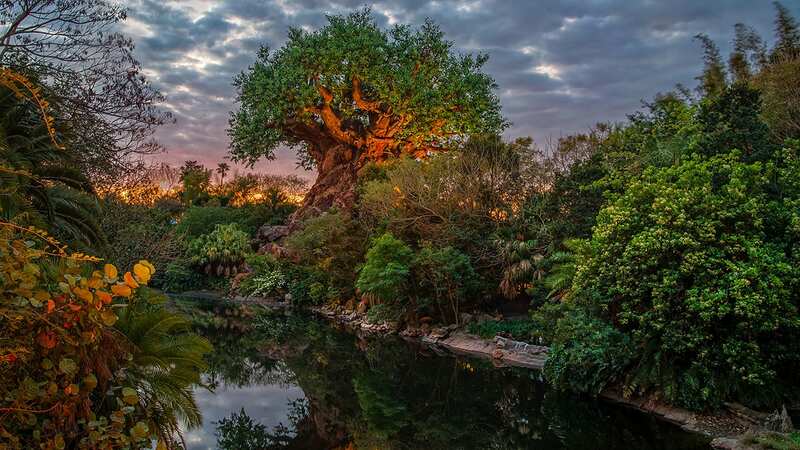 If you’re traveling to the Valley of Mo’ara at Disney’s Animal Kingdom, you’ll find that the Na’vi have created their own version of a traditional Thanksgiving meal on Pandora. 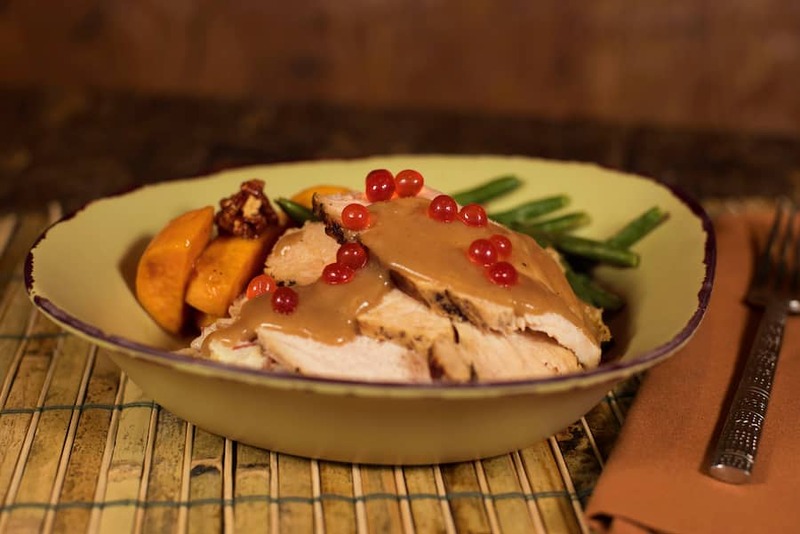 Satu’li Canteen will be serving up wood-grilled roasted turkey breast with gravy, apple and sage stuffing, green beans, orange marmalade glazed sweet potatoes with candied pecans, mashed potatoes and cranberry boba pearls; available in both adult and kids’ portions. And for dessert, you’ll find a delicious pumpkin cheesecake mousse. Over on the west coast, Disneyland park will be serving up slow-roasted turkey breast at the French Market Restaurant, with apricot stuffing, market mashed potatoes, home-style gravy, seasonal vegetables and cranberry relish, topped off with a 5” pumpkin pie for dessert! 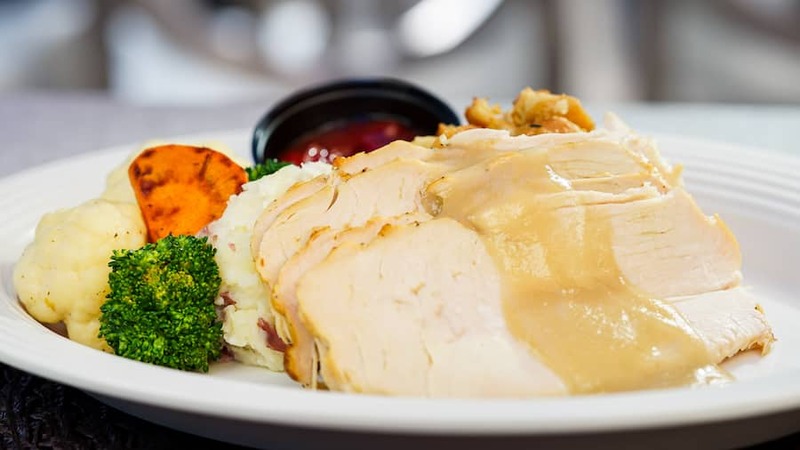 At Disney California Adventure park, Flo’s cooking up rotisserie-roasted turkey breast with gravy, mashed potatoes, stuffing, seasonal vegetables and orange-cranberry sauce at Flo’s V8 Café. Remember, these special offerings will only be available on Thanksgiving day! Available for the entire month of November, Magic Kingdom Park at Walt Disney World Resort has a few new offerings that you won’t want to miss! 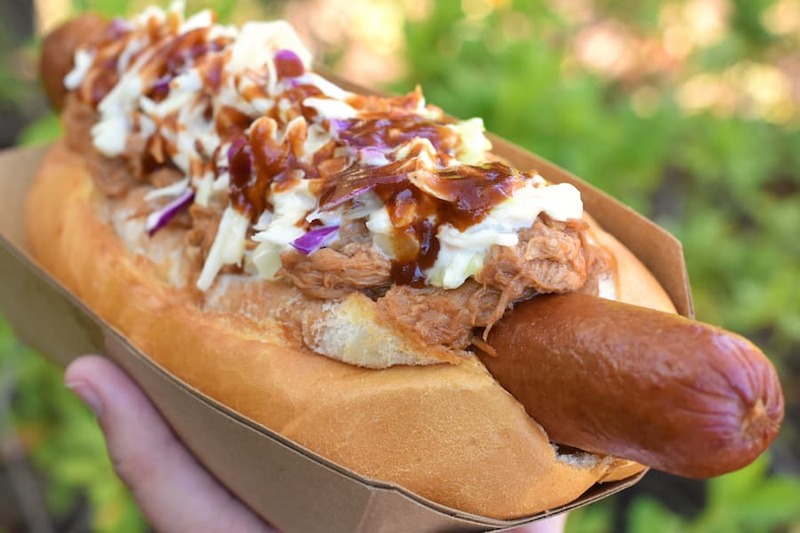 Casey’s Corner will be serving up a barbecue pulled pork and coleslaw hot dog as November’s Hot Dog of the Month, while Pinocchio’s Village Haus’s Flatbread of the Month will be a Thanksgiving flatbread, with cheese, turkey, stuffing and cranberry sauce and comes drizzled gravy. Also – a few new offerings have landed at Cool Ship in Tomorrowland! 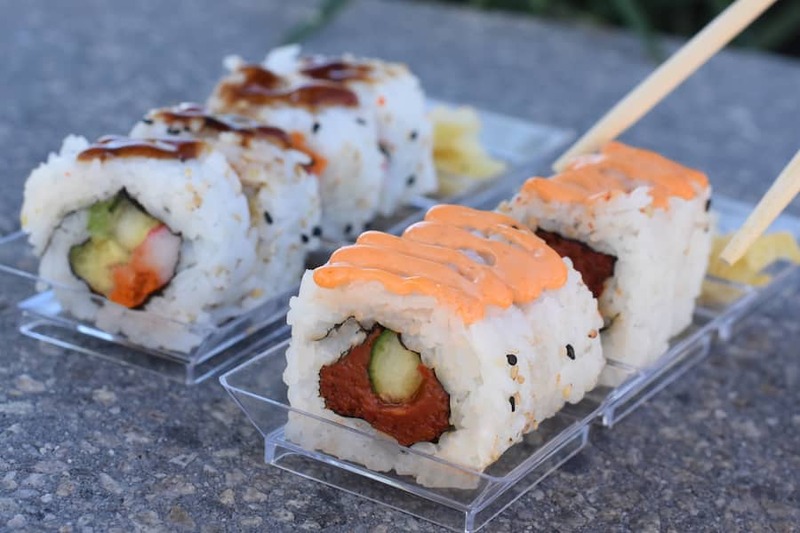 You can now order sushi – with a spicy roll and a California roll on the menu, as well as edamame salad, and all three are eligible as a Disney Dining Plan Snack. 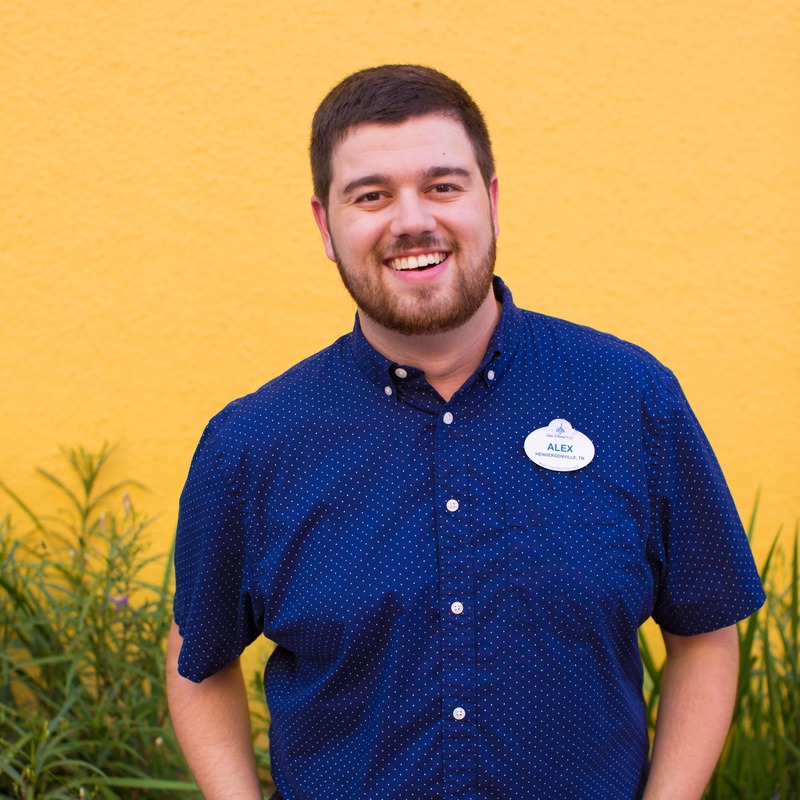 Joining in on the Thanksgiving fun this year is Chef Art Smith’s Homecomin’ at Disney Springs. On Thanksgiving Day only, you’ll be excited to find a roast turkey special. And through the month of December, try their delicious seasonal dessert, a pumpkin bread pudding served with vanilla ice cream and whipped cream. You’ll also see several permanent new menu additions like the turkey meatloaf with Vidalia ketchup served with roasted heirloom potatoes, baby carrots and brussel sprouts glazed with pepper jelly. Other new items are a grilled corn succotash and Cedar Key Island Hotel’s Heart of Palm Salad. This salad is one of Florida’s unique dishes, from the Island Hotel in Cedar Key, a tiny island off the west coast of Florida. 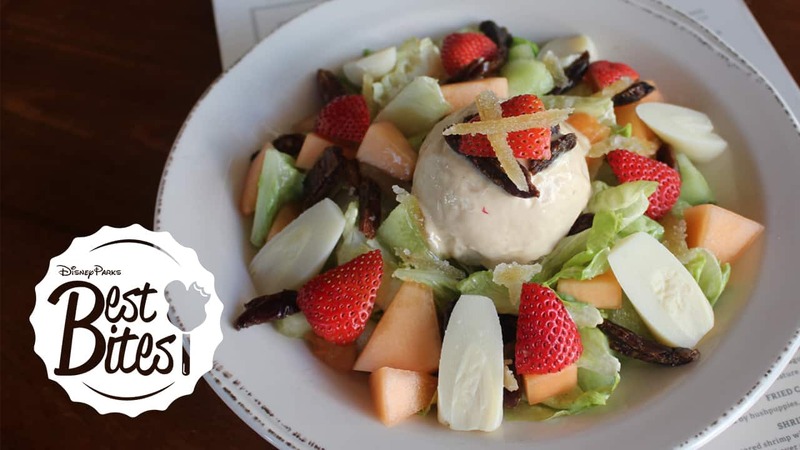 Created by Bessie Gibbs, owner of the hotel and restaurant, the salad’s original recipe calls for slivered lettuce, palm hearts and dressing with pineapple chunks, chopped dates and crystalized ginger sprinkled on top along with the signature dressing. The dressing is a mixture of mayonnaise, peanut butter and vanilla ice cream along with green food coloring. 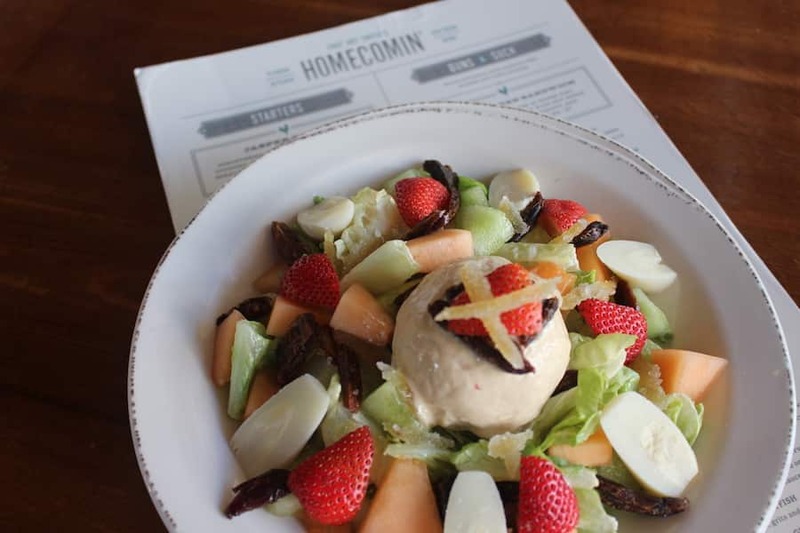 This Homecomin’ version of the salad is Chef Art Smith twist with an ode to regional strawberry and melon growers. Finally, Disneyland Resort is bringing the thunder for the release of “Thor: Ragnarok” – for a limited time only, you’ll be able find several themed offerings at Award Wieners in Disney California Adventure park! 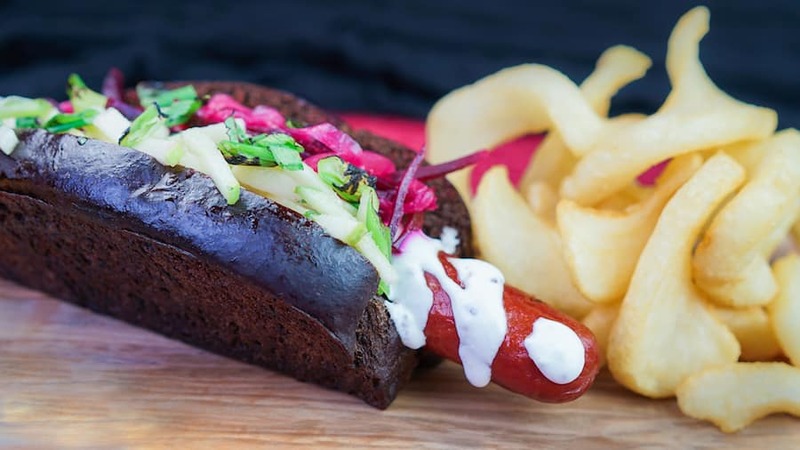 This includes Arena Funnel Cake Fries with mango topping, whipped cream and chile-lime sugar; the Thunder Dog, an all-beef hot dog on a black bun with apple slaw, beet and onion slaw, mustard crema and green onions; and the Lightning Pop, a non-alcoholic Barq’s Red Cream Soda Slush that comes with a Thor Hammer Glow Cube! Are these the only places that will be having Thanksgiving dinner available for guests in the park? I know in years past 50’s Primetime has done a dinner. I miss the Turkey meal at Flo’s. It was one of the best meals I had there. I wish it was there all month. Thank you for the preview of all the food!